How are you today! I’m doing great! 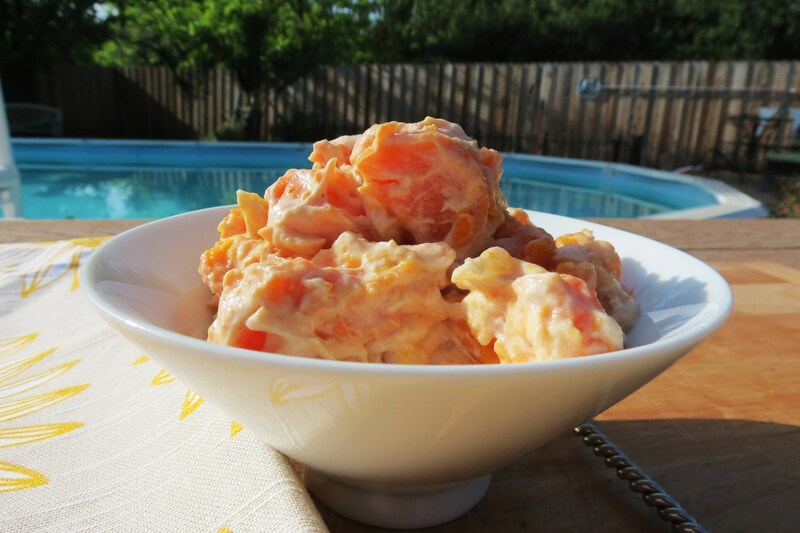 I have a wonderful recipe for you, it’s a different spin to traditional potato salad. The other day, I got some potatoes from the CSA and my Husband asked if could make him potato salad, you know the fatty kind, with a half a tub of full fat mayonnaise. Blah! I reluctantly agreed, but I made it strictly for him. Now I could make a low calorie regular potato salad for myself, but I had some sweet potatoes to use up because they were starting to bud. Don’t you hate when that happens? 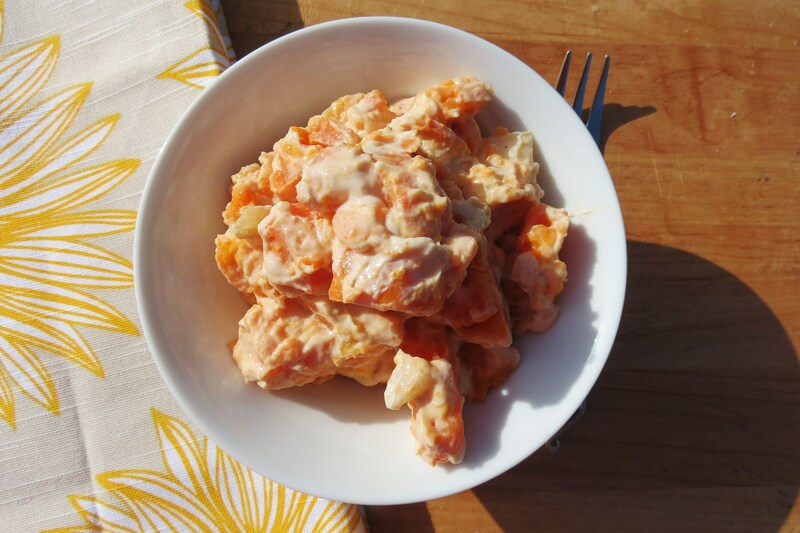 So I came up with this wonderful Chipotle Sweet Potato Salad. I thought hmmm, I love sweet potato fries dipped in my Spicy Chipotle Aiolo Sauce, why not take that idea and make Potato Salad. Well, I did and it is wonderful. If you like sweet potatoes and spiciness, then you’ll like this salad. I boiled my potatoes with Hubby’s White potatoes and you know what I found out? White Potatoes sink to the bottom of the pot, while sweet potatoes float. Weird huh? This made it easy for separating the white and the orange potatoes. My Husband would freak if he knew my orange tatters touched his precious white ones. 🙂 I still do not understand why he doesn’t like sweet potatoes? These potatoes are very creamy, so you have to be careful when your mixing it or it will become like mashed potatoes, which actually wouldn’t be too bad. The best description I can give this dish is creamy, light, fresh and has a kick! You can add more peppers to it to make even spicier. I’ll leave that to you! All I know is I love this dish and it will become a summer staple for me. It lasts for days in the fridge. I’m on day 3 of eating it. I made the portion size to serve three, but honestly it’s more like four. It’s very filling. 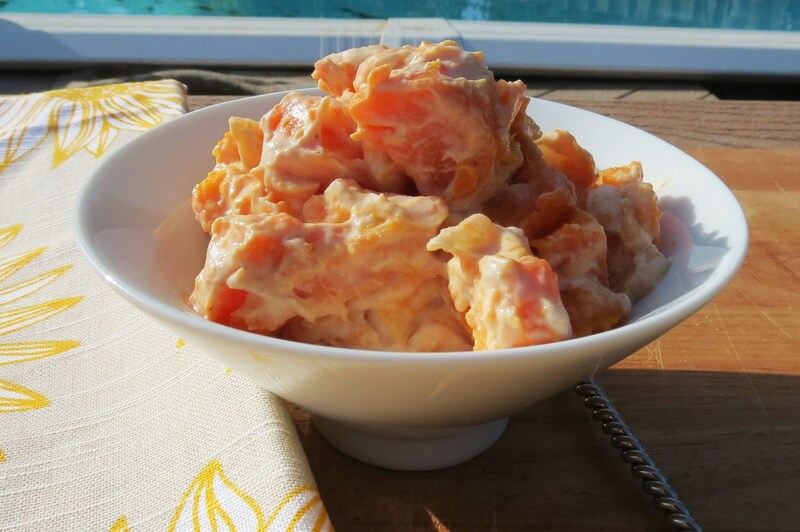 A creamy, sweet and spicy potato salad perfect for a cookout. In a medium to large pot, place your potatoes and bring to a boil, cook for about 15 minutes until potatoes are tender. Drain potatoes in a colander and set a side until cool enough to handle. Place potatoes in a large bowl and add onions, mix until incorporated. Add yogurt mixture to potatoes and mix until combined. Place salad in the refrigerator until cooled and ready to eat. Well my first day is almost through and I could handle it, except for the coffee part. I asked if I could have one cup of coffee and she said yes. I really, really tried to skip the coffee, but by 2:00 in the afternoon my head was pounding!! I broke down and got a ice coffee from Starbucks. My headache went away. Goes to show I’m addicted to coffee. The other hard part I have, is drinking 16 cups of water. I’m currently at 11 and I know I won’t make 16, but I’m really trying. Oddly enough I haven’t peed that much today (sorry thats gross). My friend said I was probably dehydrated from all the coffee I drink and my organs are probably absorbing the water. One thing I learned today is I need to drink more water! Now doing detoxes is something I never thought of doing, but I thought what the heck! Let’s see if I feel a change or if my scale changes at all. Do I feel better? No, I feel the same. I think it’s because I eat pretty healthy as it is. So this detox all in all hasn’t been hard for me, except for the coffee. Most of the food I make already, I can eat in this detox. Will I do this tomorrow? I don’t know? It doesn’t hurt, and I’ll pretty much stick to this program as is. I don’t need to make to many adjustments. Just drink less coffee, drink more water and incorporate more veggies, less sugar and less processed foods. I really believe you can have everything in moderation. As they say, what it comes down to is calories in, calories out. A person can lose as much weight eating McDonalds as someone who eats vegetables all day if they consume the same amount of calories. Why do I eat healthy? There are a few reasons, health, appearance, and I feel better, more energy! I’ll stick to what I’m doing because I’m happy! I don’t really believe in diets, it’s a lifestyle change you need to make. I’ve tried diets and I never make it past the first day! I lost weight by changing how I live. So I challenge you to make a small change to better your health! It’s the little changes that count! It may not seem like much, but the smallest change can really make an impact in the long run. Are you with me on this? Well, How I Met Your Mother is on and my favorite show Two Broke Girls is also on tonight, so I am signing off! 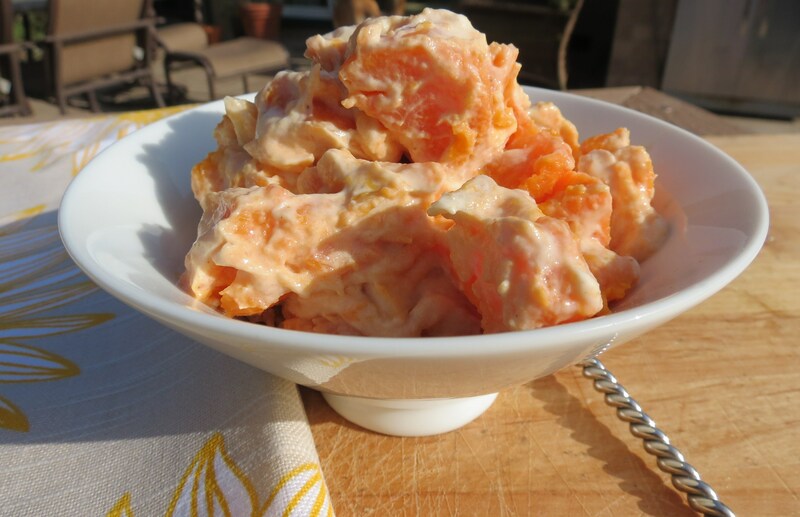 This sweet potato salad looks delish!! I am printing it out right now and plan to surprise my husband with this…he will love it! I’m interested to see how your detox goes, you may have just inspired me to try it! Hi Sarah! 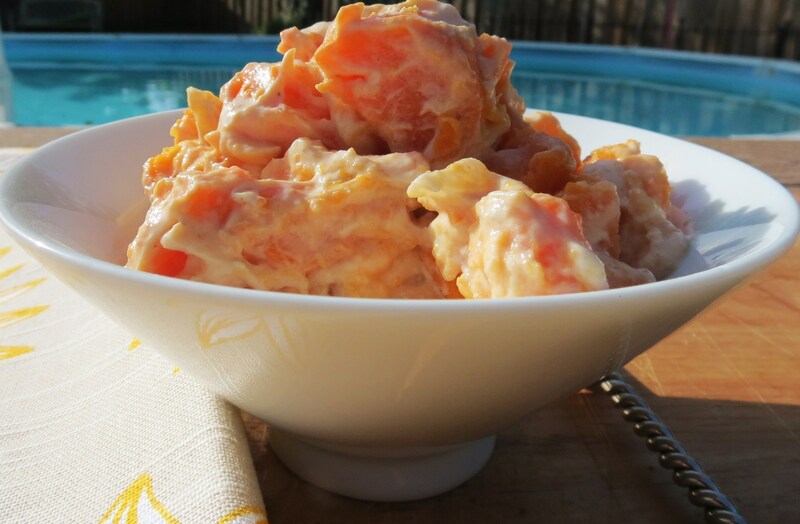 If you make the sweet potatoe salad, let me know what your Husband thinks! I am offically on day two of the detox, and so far so good! I did splurge and had a 1/2 a cup of coffee today, I was afraid of getting another headache. I did drink my lemon and water first thing this morning and I’m starting my endless drinking of water as we speak. I did hop on the scale and I lost 1lbs. Not to bad for one day! I can’t wait to see tomorrow. Have a great day! My hardest part has been the coffee, and wanting bread! Eck!! If you try the potato salad, let me know what you think! Have a great night! 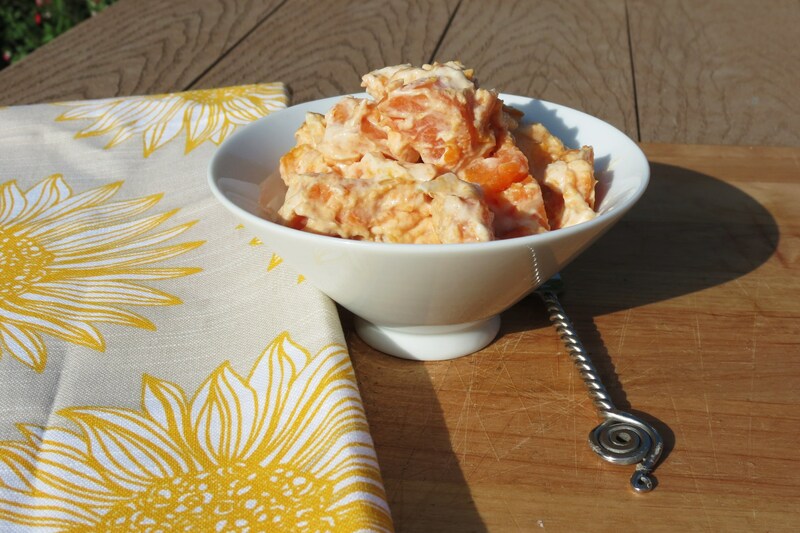 Oh, what a fun twist on potato salad! I’m certain I’d have to nix the sweet potato version for my hubby…but I’d love to try your recipe as written. I have pretty good will power, but I’m not sure I could get through your detox…I’m impressed!!! Thats funny, because now thats all I see!!! I love the idea of this salad! I could eat sweet potatoes all day long. I could eat sweet potatoes all day long to! Yum!! Funny up until a year or so ago I hated them! Now I LOVE them! Thanks about the cleanse, one more day to get through! The coffee part is hard! I snuck a half a cup today! I love sweet potatoes, I had them today for breakfast, and thats pretty normal for me, this salad looks amazing, since I love chipotle sauce too! This salad looks lovely – I’m all for healthier, more nutritious potato salads, and i LOVE sweet potatoes! I love this potato salad! I am definitely in need of a lighter recipe before summer, and this is totally it 🙂 Thank you! PS: Good luck with the detox! Ohhh, do you have a recipe on your page? I’d love to see the recipe!